Any type of emergency generally occurs when you are not expecting it, at an inconvenient time, and causes a great deal amount of stress. Dental emergencies are no exception, but knowing how to handle a dental emergency can benefit you and your smile for the future. These types of dental emergencies require immediate treatment in order to promote the most optimal healing and outcomes. It is extremely important that if you have had a tooth become knocked out that you find it (and all of its pieces, if necessary) and bring it with you to the dentist’s office. Keeping your tooth moist in milk is also highly beneficial. DO NOT attempt to wash or brush your knocked out tooth as you may damage the structure! Other dental emergencies require attention, but are not necessarily dependent on immediate attention. If you have any of the following, it is recommended that you contact your dentist as soon as possible. However, it is not typically imperative that you are seen right away. Whether or not your dental emergency is urgent, you still need to take care not to ignore the problem. How you handle your dental emergency can determine the outcome of the situation. Handling the emergency with care and patience can go a long way. 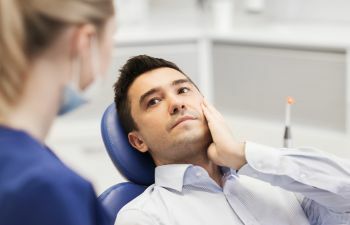 Being quick to “fix” the problem yourself can cause irreversible damage, so it is always best to bring your situation to the attention of a dental professional. At Gold Hill Dentistry, we understand that dental emergencies can be scary, stressful, and painful. We are here for you, and we encourage you to call us right away. We promise to do our best to yield the most optimal outcome.